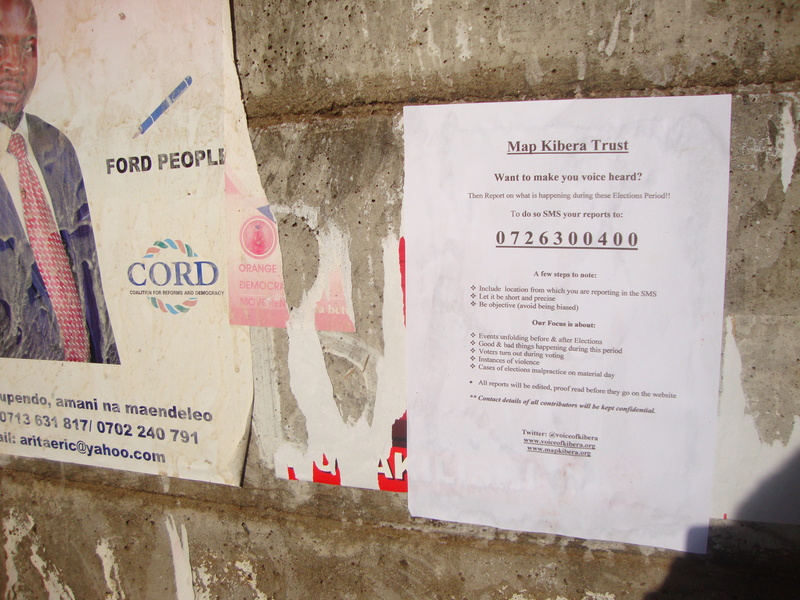 Map Kibera Trust is an organization started in Kibera way back in 2009. It comprises with 3 Kibera programs which are the Mapping Team, Kibera News Network and the Voice of Kibera as well as programs in Mathare and Mukuru. Map Kibera Trust Vision is a society in which access to open information contribute to positive community transformation. In line with its vision and the readiness to monitor and cover the upcoming elections there are lined up activities geared towards having a successful process. Some of these activities are the Wall Painting along the Kibera Drive, Map distribution, Media outreach, Community screening, Presentations, Stakeholder Mapping and fliers and posters distributions. We have successfully managed to do Map Distribution, Community screenings, Presentations, Stakeholder Mapping and Posters and Fliers distributions. Having done the first digital map in Kibera late in 2009 the Trust has always been in an exercise of updating the map, printing and doing the distribution to Organisations in Kibera based on their thematic areas of operation which include Health, Security, Education among others. 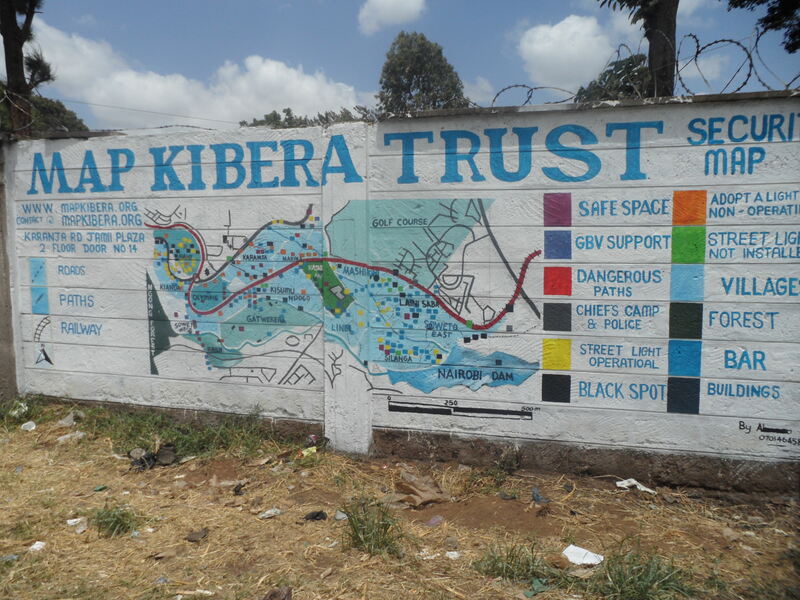 In light of the fact that Kibera is densely populated it was not possible to distribute the maps to everybody and as such Map Kibera Trust sought to have the map painted on the wall. Several attempts were made to find the wall on which to paint, finally a place was identified along Kibera drive opposite the Mosque. The wall painting of the map will see other successful paintings in Kibera which will easy access to information and stir up community engagements at different levels. As a matter of fact our mission of being a reliable source of community generated information will be achieved. The power of information provided by the maps if well utilized will trigger development in Kibera and its environs. On the 7th, 8th and 9th posters and fliers were distributed apart from sticking them in strategic area like DC, Kianda, Soweto and Highrise. The main aim of doing the distribution was to get the general public participation in reporting the events unfolding during this elections period since we will not be in all the locations at the same time. As the Voice of Kibera we will produce and distribute posters and fliers 3 days to the election date whose content will focus on the key issues to report about and the social media links where we will interact with them during the elections period. As we move to create awareness in Gatwekera, Kambi Muru, Olympic, Makina and Kisumu Ndogo we are optimistic that we will meet community members who are willing to complement our work during and after the election exercise. “Our team will go out of their way to report on the good as well as bad things happening at that time. This will put to a stop the misreporting/propaganda from the mainstream media.” Said the Voice of Kibera Team. This entry was posted in Education, Elections, Empowerment, Environment, Health, Kibera, People, politics, Security, Uncategorized and tagged elections, Flliers, Kibera, KNN, Mapping, Posters, VOK, Wall paining. Bookmark the permalink.